With so many options today, choose a backsplash that fits your style. If budget is a concern, there are many Formica options on the market that look great. This granite countertop and backsplash form the background for the copper sink. If you're doing a kitchen or bathroom renovation, you've probably already started thinking about countertops and cabinet colors, but have you realized the many options you have to create a backsplash that enhances the design and complements the ideas you have so far? Backsplashes serve a very important purpose of protecting your walls from water and grease splatters, and prevent spills from running off the counter and down behind your cabinets. 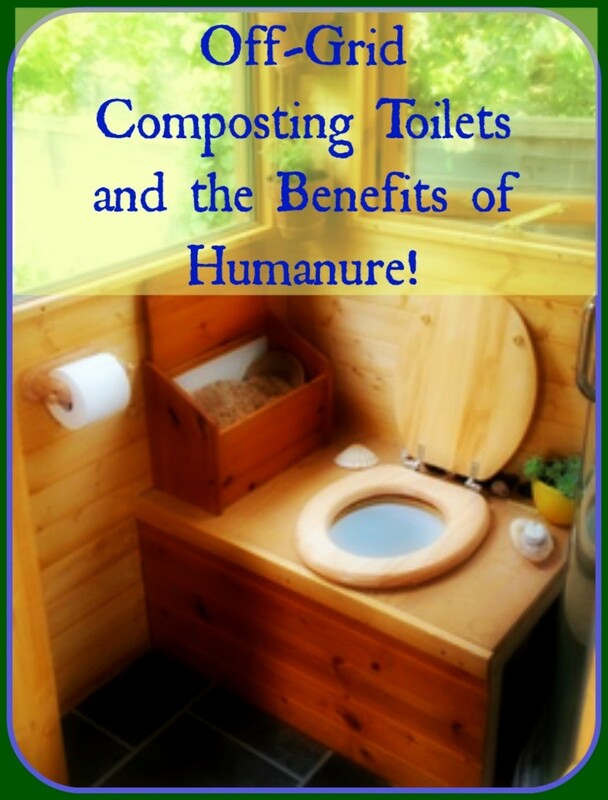 But they can also be very instrumental in tying together all of the materials in a kitchen or bathroom. You can use them to create their own design elements or focal point in a room. Let's take a look at 3 decision points that are important in determining the look you want to achieve. What materials are best for a backsplash? One of the most common backsplash material choices you will find is to use the countertop material and simply continue it up the wall a bit. This provides a very uniform look and can make the counter space appear larger. This is a great choice if there are already several other materials and colors used in the room. 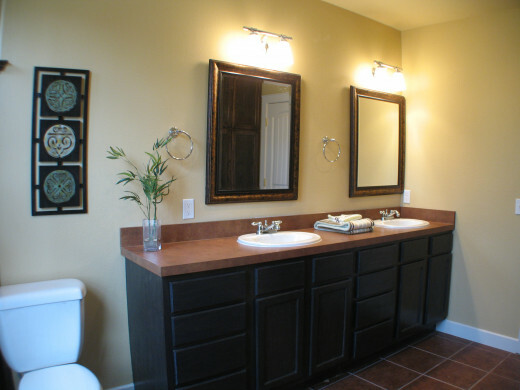 The dual sink bathroom to the right uses a rust colored Formica counter and backsplash to match the floor and provide contrast to the ebony stained cabinets. 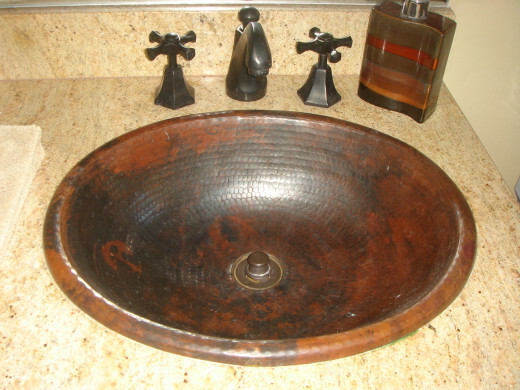 In the second bathroom example, the granite is countinued up the wall and allows the copper sink to take center stage. There are endless possibilities today if you want your backsplash to make a statement or provide a contrast to the counters. 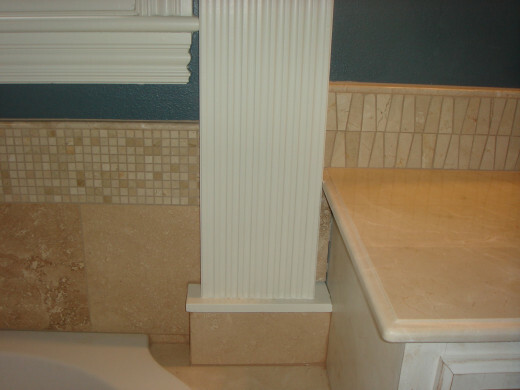 Almost any kind of tile will provide the needed protection from water and food, so have fun with the options. You can choose the small mosaic tiles in a multitude of colors. Floor tiles to unify the room are a nice option. Glass tiles in a variety of shapes, sizes, and colors allow your imagination to run wild. The tiny black tiles in the kitchen below coordinate with the black appliances for a sleek look. Floor tiles were used on the shower walls and tub surround in the bathroom below to make this small master bathroom feel larger. To go along with the water theme in the third example, dark blue wavy glass tiles were used to resemble waves in the ocean. Specialty tiles can be very expensive compared to other options, but when used in small amounts, they can create a big bang for a few dollars. Small, shiny black tiles coordinate with the black appliances. 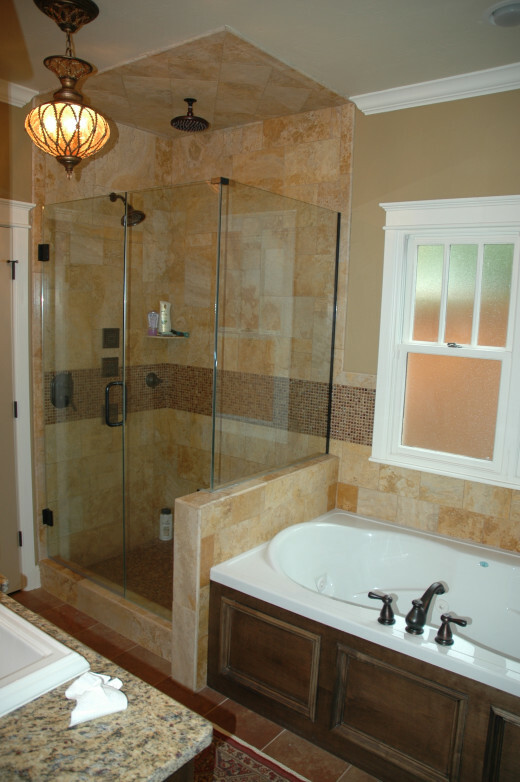 Using the same floor tiles for the shower walls and tub backsplash makes this master bath feel more spacious. Specialty tiles can be more expensive individually but if you just need a small amount, they can be a great way to add unique elements to your room. If you want to play up the paint or other wall features, a small backsplash works great. 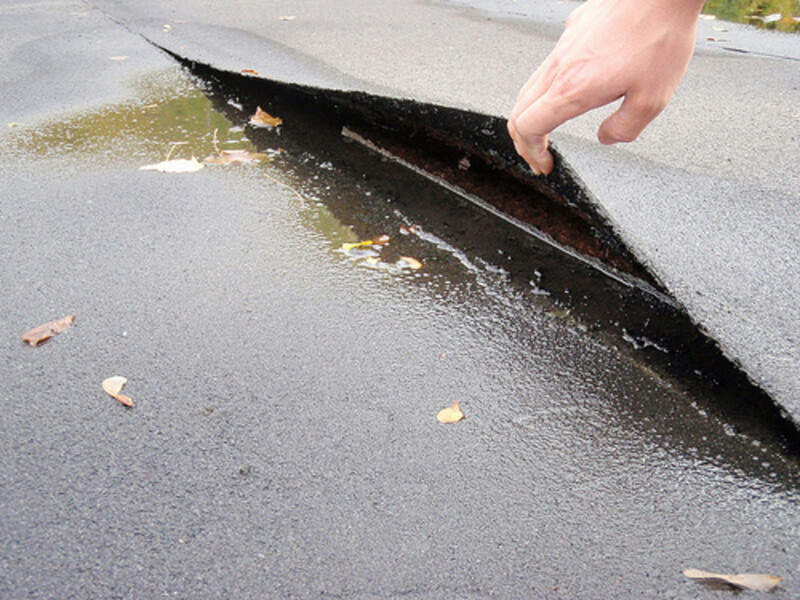 Add interesting detail with a special cut to the edge. This backsplash was made a bit wider than normal to play up the pattern of the tile. 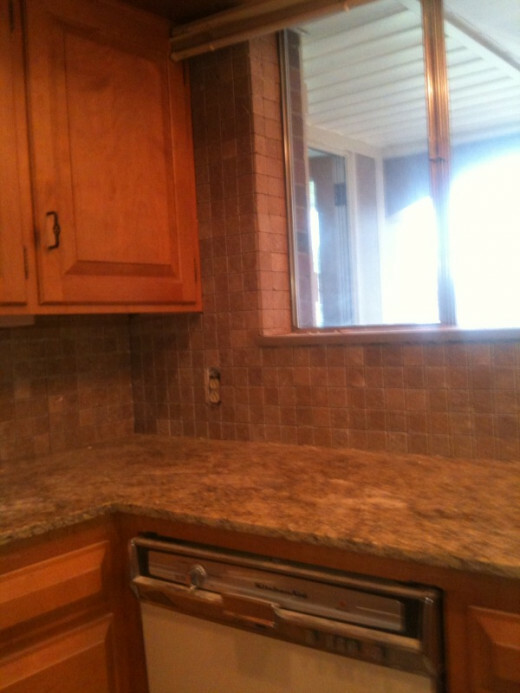 Rather than introducing an additional color to this kitchen, the tiles were installed surrounding the whole window. You can vary the sizes of the backsplash to create a focal point without changing materials. How big should a backsplash be? Another decision to make when creating a backsplash is to determine how big you want it to be. 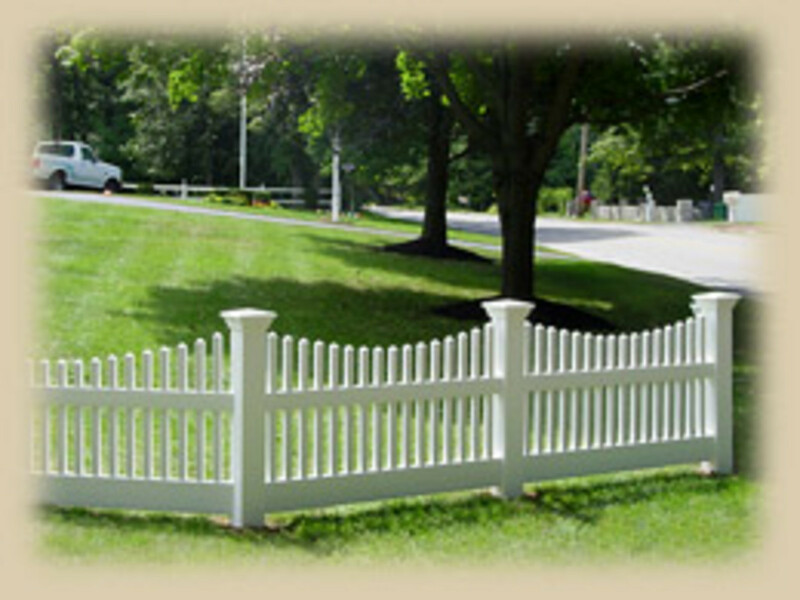 Anything from 4 inches to the full size of the wall might be appropriate for your situation. Take a look at the examples to the right as we discuss the possibilities. In the first kitchen example, the white Carrera marble is extended up the wall about 4 inches. The counter top space is fairly expansive, so there was no need to extend it further up the wall. The marble was cut with an ogee edge, the same as the counters, to match the formality of the style and add interesting detail. In the second example, the tile was extended to almost 8 inches to allow the design to be picked up. It was framed with a thin silver pencil tile to add a finished, streamlined look. In the next example, the tile backsplash fills all of the wall space not taken up by cabinets. This option works well when there is no logical cutoff point to the end the backsplash or you want a uniform wall style. But be careful not to overdo it. If there is too much wall space this option can feel overwhelming. For large kitchens, a combination of sizes might be the best option. In the last example, the majority of the backsplash is a standard size. Behind the stove and sink (not shown) the tile is taken all the way to the top and creates a focal point without adding additional materials. 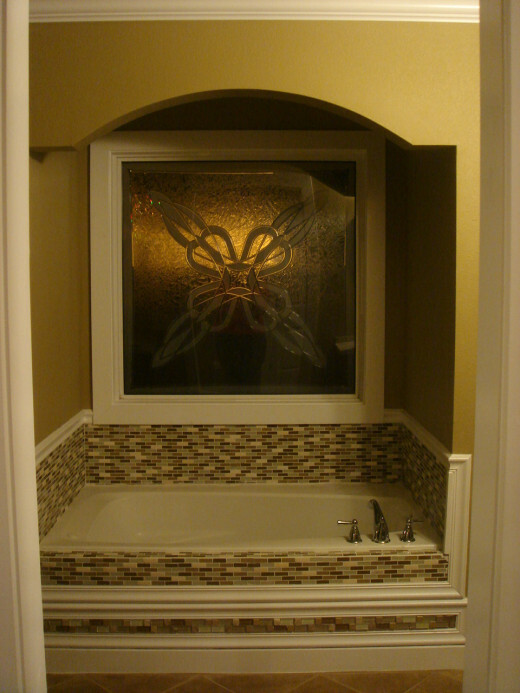 The decorative picture window and custom tiled tub surround make this area the focal point of the bathroom. 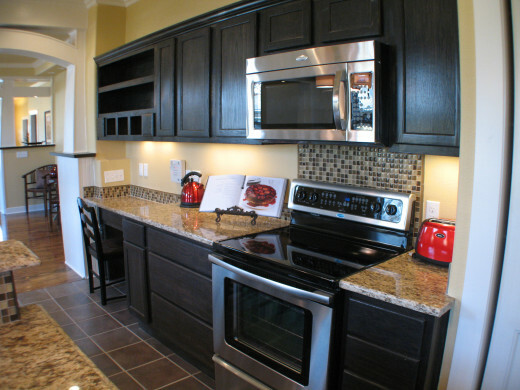 This backsplash, professional grade stove, and custom cabinetry make this area stand out in the kitchen. The backsplash in this buffet/wine rack create a stylish serving area. How do you design a backsplash? Lastly, let's talk about how backsplashes fit into the overall design of a kitchen or bathroom. There are two basic options. Part or all of the backsplash can be used as a focal point for the room. Or it can be complementary to other elements in the room and, thus, used to tie everything together. Take a look at the pictures to the right for some examples of backsplashes used as a focal point or primary design element. The tub in this bathroom got a makeover with a colorful tile surround. 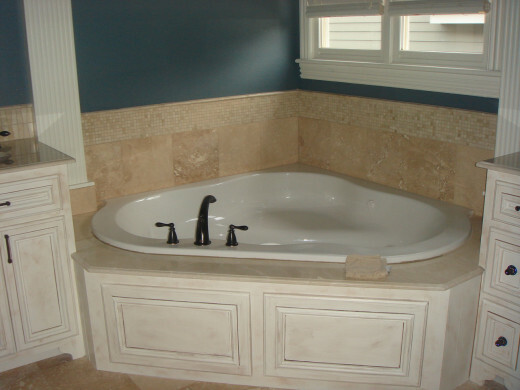 It was installed traditionally around the back of the tub but also in the front to add more color and focus. 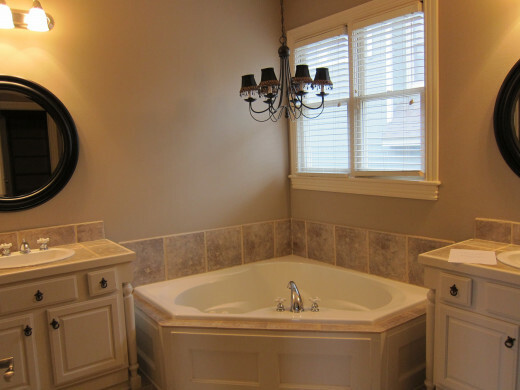 Along with the picture window, this tub is the primary focus of this bathroom. The kitchen in the middle has white marble counters, sealskin grey cabinets, and hardwood flooring. 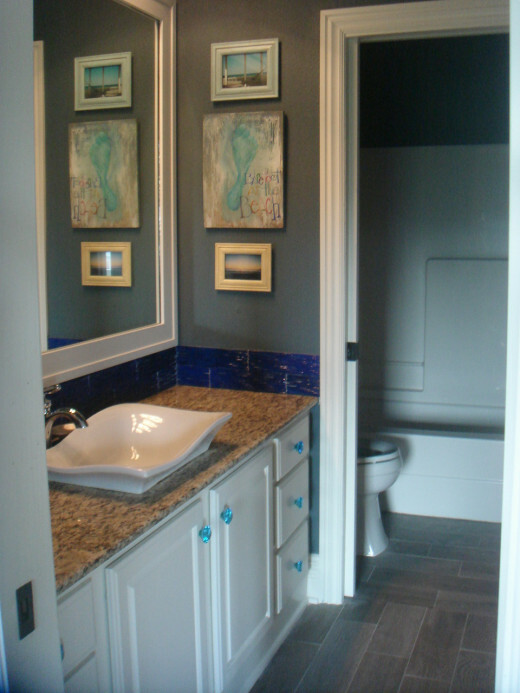 The focal point is the modern aqua blue glass tile combined with an older arts and craft style ceramic tile. 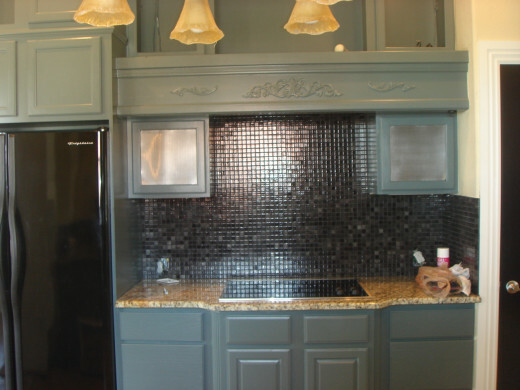 Since the cabinets fully surround the stove, this full wall was tiled and creates a true focal point of the kitchen. 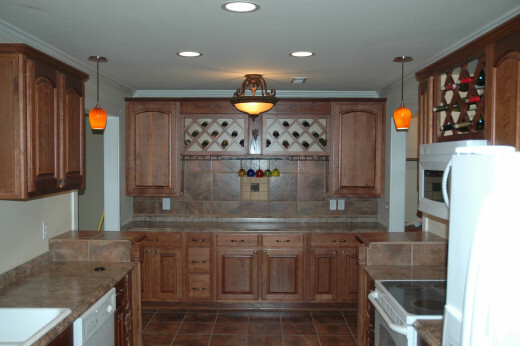 In the last example, the end of the galley style kitchen was used to create a buffet and wine storage area. 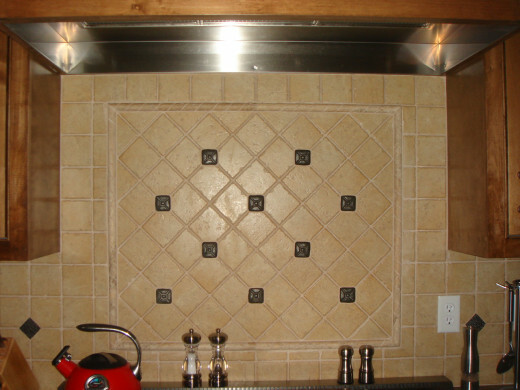 The floor tile was used for this backsplash, with a single decorative tile in the middle to create a centerpiece. 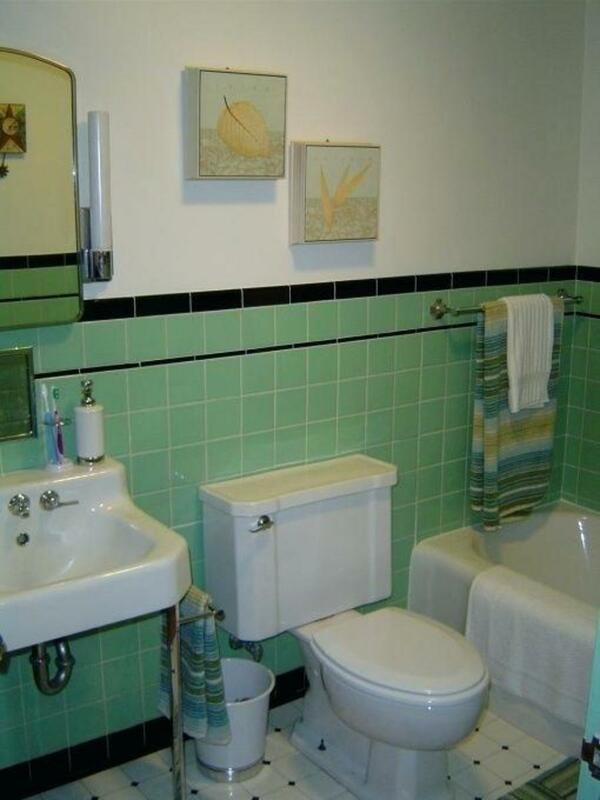 In the bathroom below, a single color was chosen for all of the tile. But different types and shapes and textures help to tie everything together but still keep it interesting. 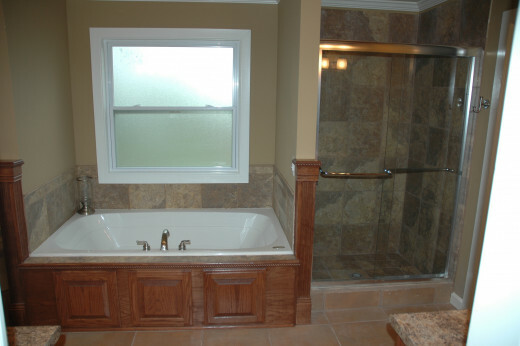 Travertine was used on the floor, shower wall, and bathtub backsplash. The tiny tiles used in the floor of the shower were also incorporated into the tub backsplash. The stripe in the shower wall is used for the sink backsplashes. 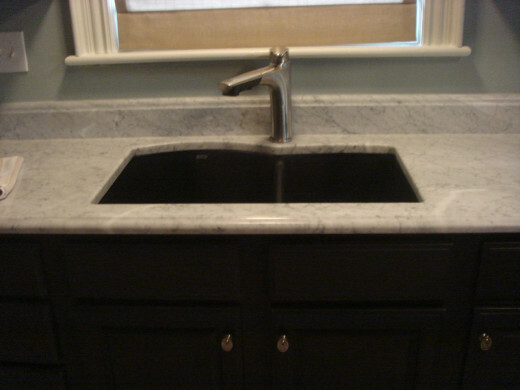 Lastly, the granite for the countertops stays with the same color scheme but adds a shiny, marbled texture. 'Before' picture of this master bathroom. "After" The tub backsplash incorporates the floor tile along with the shower floor tiles. 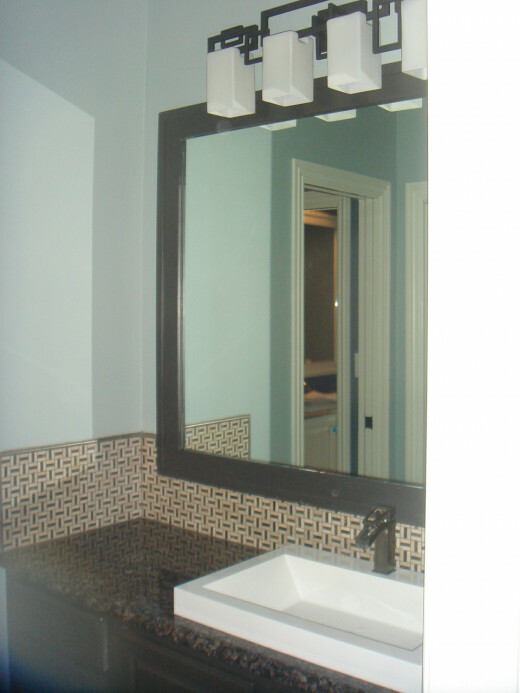 The floor tile was used for the shower walls and the tile in the stripe was used as the backsplash for the vanities. Close up of the variety of materials used to add texture and interest within the same color scheme. 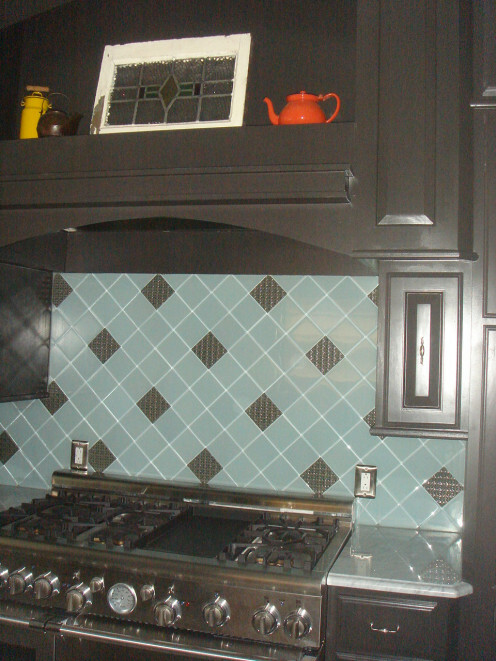 Consider using the same tile behind the stove but in a different design. 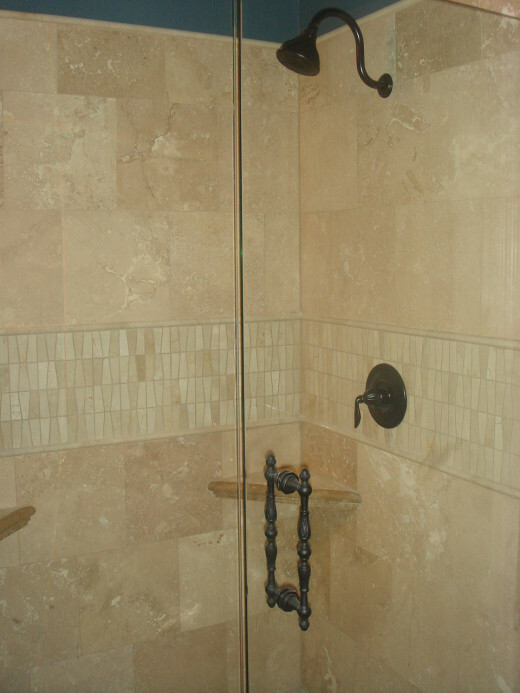 Unify the shower and tub areas by using the same tiles and patterns. The stove backsplash in the kitchen to the right utilizes the same tile as the backsplash in the rest of the kitchen but the tiles are turned at an angle and framed in. So the design of the tile creates the differentiation needed to add a bit of focus while still coordinating with the rest of the kitchen. In the master bath, the tiny darker tiles used in the floor of the shower are repeated in the stripe that goes through the shower and onto the tub backsplash, creating a unified space instead of two separate areas. These are just a few examples within the multitudes of possibilities available today to create a useful and beautiful backsplash for your space. What ideas will you come up with? Hi, I am in the process of repainting and doing a make over on our bathroom. We have been in our house for 10 years so its time. Nice Hub.